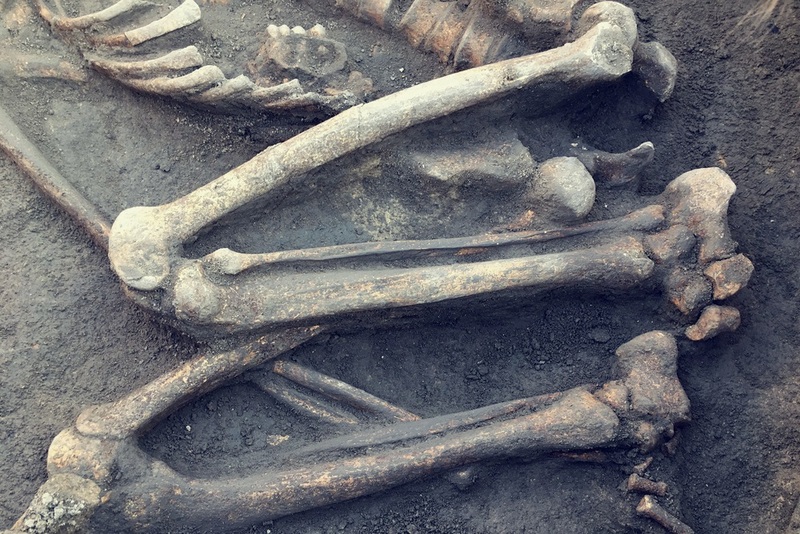 Extracting DNA from bones, especially those buried for a long time, has traditionally been forensically focused on tapping the inner parts of the long bones—the central part of the femur, for example. But a new study from Michigan State indicates that the ends of the bones are a better target—and there is a vast complexity within a single bone’s DNA sources. The findings are published by The Journal of Forensic Sciences. The scientists took the bones from pigs and cows, measured the DNA before and after months of exposure—either underground, or on the ground out in the elements of Michigan. The parts included femurs, heel bones and ankle bones. The bones were drilled, and the DNA was amplified through PCR on an iCycler thermal cycler made by Bio-Rad Laboratories. The greatest DNA amounts were taken from the epiphyses, or the ends of the bones, with less genetic material from the metaphyses, and the muscle attachment sites. Over time, of course, there was less DNA. But the rates of decline differed greatly. In contrast to popular wisdom, the least DNA (both nuclear and mitochondrial) was found in the diaphysis, the central shaft. That finding could turn forensic DNA on its head, according to the paper. The epiphysis, or end parts, were the richest source of the genetic material. David Foran, the corresponding author of the paper, who is also the director of the Michigan State forensic science program, told Forensic Magazine in a Tuesday interview that the concept for the experiments came from experience. Previous DNA trials in cow bones had shown the team that there were higher DNA yields out toward the metaphysis, and not the central shaft of the bone. The new experiments, Foran said, have borne that out. "The mid-shaft diaphysis was not the best spot, pretty much ever," Foran said. One caveat is that the pig and cow parts were from animals that were adults that were nonetheless relatively young; as such, it could be that these animals were still growing, leading to more DNA material in the epiphysis, which is more dynamic in the growth process. - Buried bones had DNA that degraded much faster than those exposed atop the soil, even though they were separated by only 8 inches. - The DNA yields actually increased from week one to two when the bones were exposed to the elements, surprisingly. - Demineralization liberated more DNA from the diaphyses, while standard buffer solution brought more DNA from the epiphyses, according to the results. - Some DNA that survived longer periods of burial were actually of higher quality—and could be more detectable than the samples that degrade faster, the authors add. But the nuances of these findings within these skeletons—and where to target DNA extraction—could be the crucial factor in cracking a forensic case, add the scientists. “These factors could not only influence the decision as to which bone(s) to assay if alternatives exist, but also where on the bone to sample in order to optimize DNA recovery,” the authors conclude.